Where Time is Slow & Life is Gracious. Region: Little Rock Downtown Historic District, minutes from River Market. Gracious accommodations and affordable luxury await leisure and business guests at Rosemont. 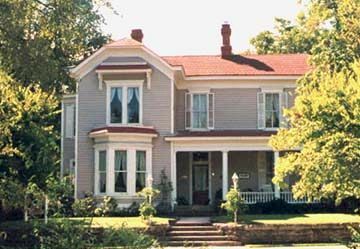 The Inn has five Guest Suites all with private, inroom bath, a queen or king size bed, phone, data port, TV / VCR / Cable and a full southern breakfast served every morning (early for our business guests). Guests enjoy our front porch, a secluded garden, comfortable parlor plus a guest refrigerator and pantry stocked with complimentary beverages and snacks. Two Guest Suites, The Somerset (shown above) and The Hemingway, have oversized Jacuzzi tubs. In addition, The Somerset has a fireplace and king bed- The Hemingway is wonderfully secluded with its own private entrance. Our first floor guest room, The Dickinson, is just steps away from the front porch and parlor has the original fireplace and an oversized claw foot tub with full shower. 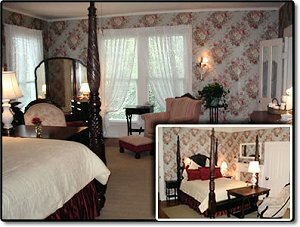 And a very special suite, The St. Clair, has a seperate enclosed porch perfect for curling up with a good book or it sleeps another person in comfor and privacy. All Guest Rooms have in-room coffee & tea service, a luxurious terry cloth robe, hair dryer, iron & ironing board, alarm clock, magnifying make-up mirror and a variety of soaps and shampoo. Of course, we have central air and heat and on-site parking. We try to think of everything for our guests. $79 Single Occupancy, $89 Double Occupancy for Business Guests - Monday through Friday; Same rate for MidWeek Guests on Selected Guest Rooms. Weekend rates range from $89 to $125. Visa, MasterCard & American Express - 5 Day Cancellation for Weekends; 3 Days for Mid Week and 24-Hours for Business Guests - Smoking on Porches & in the Garden - Check-in 3:00; Check-out Noon. 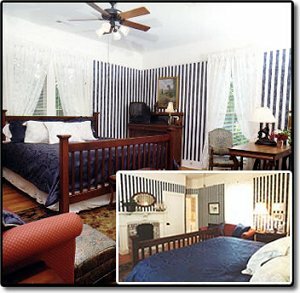 This and other Little Rock Bed and Breakfast Inns can be found here in The Register.